He gave an involuntary shrug as he realised he was now mulling over three deaths, three killings: that of Maximiliano, Concha, and the girl who'd been found in the same spot as his sister just a few days before, Mirella Faro. If Albacete was reaching out to pull him in, so the policeman within him was coughing and hacking itself back into wakefulness. A life outside the Policia Nacional? What the hell had he been thinking. In the pit the first bones are slowly uncovered. They decide to concentrate on the first body before excavating others. More remains are unearthed: cloth, hair, a pair of spectacles. The man with the briefcase is sure. This is the body of Maximiliano Camara. Max Camara is at the hospital in Albacete. A homicide detective with the Valencia police, he is on indefinite sick leave and the news of his grandfather's stroke has brought him back from Madrid where he has been staying with his girlfriend Alicia. Now Max sits by his grandfather's bedside and reads him parts of the local newspaper: the excavation of a mass grave of Franco's anti-fascist victims in the town cemetery and the body of a raped and murdered fifteen-year-old found dumped on a rubbish tip. His grandfather's housekeeper, Pilar, arrives to take over the bedside watch and Max feels free to return to the flat. Darkness is falling as Max walks through the familiar streets and he is drawn to the industrial estate where the young girl's body was found. He is examining the taped crime scene when a squad car draws up and he is arrested. He protests, explaining that he too is a policeman – but he is knocked unconscious and wakes next morning in a police cell. He is escorted to the commissioner's office where he finds his childhood friend and fellow police academy student, Ernesto Yago, currently chief of police in Albacete. They greet each other warmly and Ernesto writes an explanatory report in favour of Max: his sick leave, his grandfather's illness, and the fact that the murder scene Max had trespassed had the same scenario as that of his murdered sister, Concha, – thirty years before. By now Max is anxious to return to the hospital, but there he finds neither Pilar, who has taken umbrage at Max's own non-appearance the previous evening, nor his grandfather, Hilario, who has discharged himself. At his grandfather's flat Max finds him remarkably strengthened and convinced that all he needs is rest. They are interrupted by a caller, a man from the Historical Memory Association, who has come to tell them that he believes they have finally found the body of Hilario's father, Maximiliano Camara, amongst the mass grave victims in the town cemetery. THE ANARCHIST DETECTIVE is Anglo-American writer Jason Webster's third book in his “Max Camara” series set in Spain. Webster himself has lived in Spain for many years and had already written several books about Spanish culture and history before embarking on his series featuring Chief Inspector Max Camara of the Spanish National Police. He attributes the influence of Michael Dibdin's “Aurelio Zen” novels to his realisation that: “good, thoughtful crime novels could be set in a contemporary Mediterranean country”. 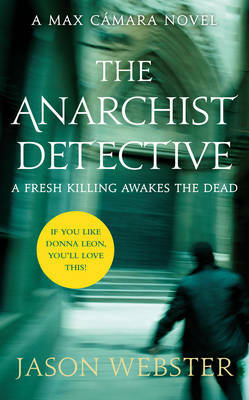 Not having read the previous two books in the series, OR THE BULL KILLS YOU and DEATH IN VALENCIA, didn’t seem to matter as I was quickly drawn into THE ANARCHIST DETECTIVE. A troubled Max, poised to leave his police career and called back to his home town of Albacete, finds Spain's conflicted past mixing with the present as the bones of his anarchist great-grandfather are exhumed and a murder brings unwanted memories of his own sister's death. When old friend, police chief Ernesto, enlists Max's help in investigating a possible saffron scam in a nearby village – the bullets start to fly. The book's pace is fast and the plot involving, but the strength of Jason Webster's writing lies in the vivid atmosphere he creates and his characterisation. Through their interactions and conversations his characters come alive with little need for descriptive explanations of who and how. (Hilario Camara, for one, is a creation not to be missed.) Webster successfully interweaves the past with the present using this technique. For anyone who likes their crime fiction laced with social and political history THE ANARCHIST DETECTIVE is a good read, a short but penetrating book that beckons you to read more of Max Camara and Spain. Nice take! I just finished this excellent book. The first two are well worth reading as well. I have read both of his preceeding books in the series and I enjoyed them very much. I echo your comments re the writing. Interestingly, though both the first and second are available on Kindle in the US, the new book is not - don't understand that.